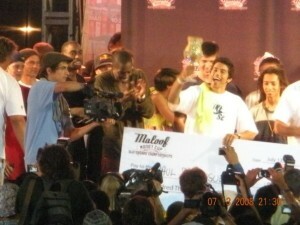 The first annual Maloof Money Cup was held at the OC fairgrounds in Costa Mesa. The turnout was great and the weather was perfect for a skate competition; especially one offering the largest prize pool ever ($400,000+) with first place receiving $100,000 in street. The winner turned out to be Paul Rodriguez as seen below celebrating! 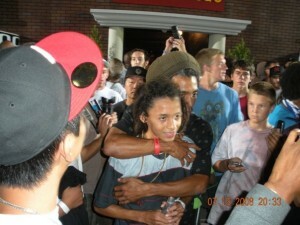 Second place went to Nyjah Huston, which was questionable and brought up a lot of debate in the social media real; especially forums and YouTube videos showing the last runs. It turned out to be quite a fun weekend for everyone and there were suprise guests and artists such s Lil Jon an many others, too many to remember. Overall it will be great to have this return next year to the OC Fair Grounds. 48 skaters, 24 on Friday, 24 on Saturday. 6 jams, 4 skaters per jam, 5 minutes per section, course divided into 3 sections. Five judges score from 1 to 100 based on overall performance per section. Total score from all 3 sections is your final score. Top 6 from Friday and top 6 from Saturday advance to 12 skater Finals. 4 jams, 3 skaters per jam, 7 minutes per section, course divided into 3 sections. 6pm – 8pm – Last Chance Pro Street Qualifier – for selected pros that did not get an invite to the main Street Qualifiers on Friday and Saturday. Top two make the cut to skate on Friday in the Qualifiers.